If you think of a filo pie, it is likely that you think of those belonging to Greek cuisine. Well this is my take on the traditional spanakopita! Spanakopita usually includes spinach and feta but I have given it a twist to include kale and halloumi as well to make it even more scrumptious. I have used readymade filo pastry to make this even quicker and easier to make and to serve four people a pie tin which is 22cm in diameter is perfect. The pie also keeps well in the fridge for a day or two and the leftovers are great for a simple lunch. 1. Start by preheating the oven to 200c/ 180 fan or according to the instructions on the pastry packet as it can differ from brand to brand. Make the pie filling by wilting the spinach- you can do this by pouring a kettle of hot water over it into a colander before then squeezing out the excess water; set aside. Take a large frying pan and heat a glug of oil over a medium heat. Add the garlic and spring onions and cook for a minute before adding the kale; cook until the kale is wilted and keep it moving so the garlic and onion does not catch. For the last minute or two of cooking, add in the drained spinach and dill. Remove from the heat and allow to cool. 2. When the filling is cool enough, crumble through the feta and grated halloumi. Beat one egg and stir through the spinach mixture and season with pepper. You should not need to use extra salt as the feta and halloumi will provide this seasoning for you. 3. Now to assemble the pie! Gently melt the butter in a small pan over a low heat and dig out a pastry brush from the depths of your kitchen drawer! Brush a light coating of melted butter in the empty pie tin before adding a sheet of filo. Filo is delicate so be careful when lining the tin. Brush the filo with more butter before adding the next sheet. Line the tin so each sheet of filo is put in at a different angle. Repeat so you have about 5 layers of filo on the base of the tin before adding the cooled pie filling. Make sure it is evenly distributed and press lightly with a back of a spoon to flatten. 4. Gather the edges of the filo sheets and fold in the centre of the pie tin. Brush with more butter. I then took a couple of extra sheets and ripped and scrunches them up and popped them on top of the pie before, you guessed it, brushing with more butter. To stop the filo from curling lightly sprinkle it with water before baking in the oven for 30-35 minutes until golden and hot. Serve with a simple side salad, sautéed potatoes or a liberal helping of cooling tzatsiki. 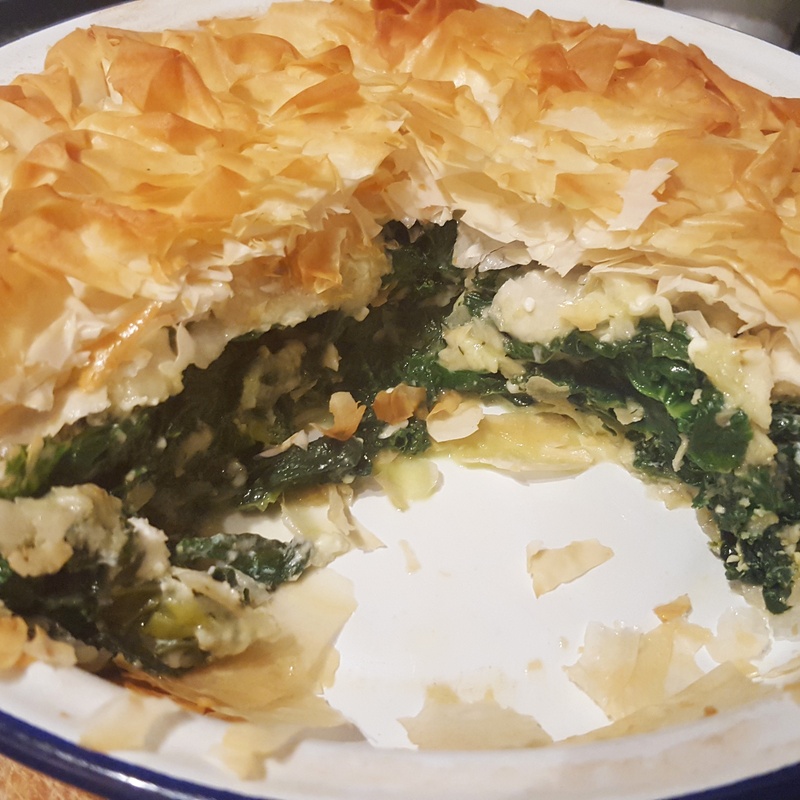 Kale, spinach and cheese filo pie- my take on spanakopita which is fit for a king!